Machine Engraving - This is carried out by an electrical pen engraver and is an inexpensive engraving option. They can only do basic initials or inscriptions with pen engraving option. This is usually a 2-3 day turn around as the work is carried outside the premises. Costs start $40+ depending on size of the item, font & how many letters. 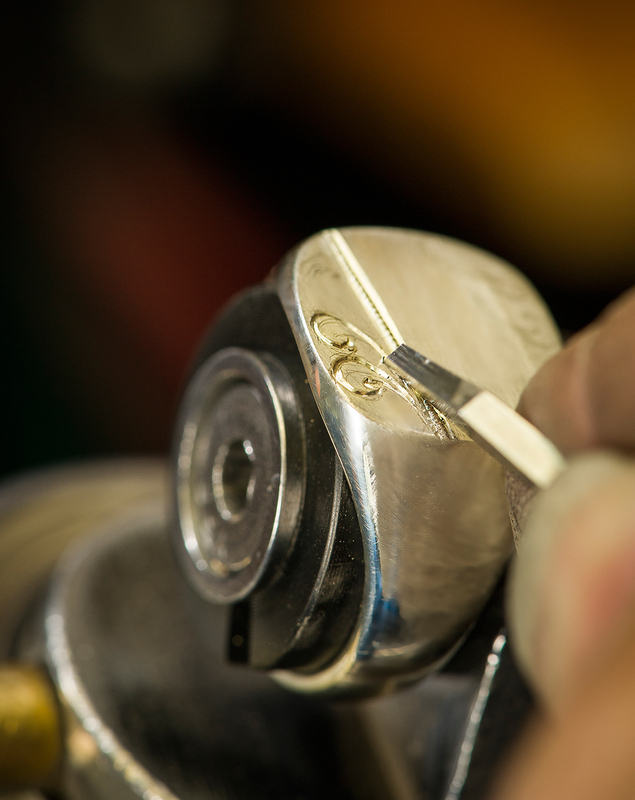 Hand Engraving - This is carried out by our skilled engraver who is a highly skilled craftsman. He can recreate the original engraving designs that were once used over 100 years ago. Our engraver studied in Ireland and England where he attended a college of art and learned to be an artist. He uses original antique chisels that have been passed down to him from other master engravers; some of these tools are well over 100 years old. He also specialises in heraldic engraving and family seals (coats of arms) and crests. This is an intricate process and is very time consuming. He also does ecclesiastical work for churches, engraving upon chalices and crosses. Jobs may take 2-3weeks to be completed in busy times. He can also draw your designs first for your approval for a small fee. Costs start from $150+.